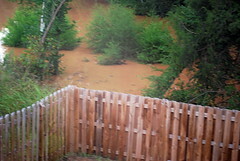 Don’t know if you heard, but we had a flood last week due to the remnants of Hurricane Fay. The weather people didn’t call for it really, just some rain. So we went to sleep thinking we were just getting rain. We woke up and flipped out. There’s a huge “natural” area behind our house. Our lying builders told us they were going to put a pool and a playground there. Well, we sure did get our pool! Click to enlarge the pics. Poor CSP was running around with the weather on the tv, computer, & radio. Trying to decide when & if to start carrying valuables upstairs. I took these pics from our master bedroom window on the 2nd floor. 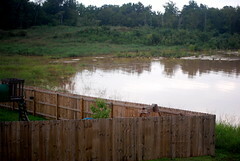 Thankfully we were spared and the water didn’t come into our yard. It was a close call for sure. Now if we can just get through the rest of hurricane season! OMG! that DID come close. sheesh. Those builders need to get some better drainage STAT! Yall could be in a MESS this weekend with Hanna..Do the puggies have a raft? Man, that is crazy. 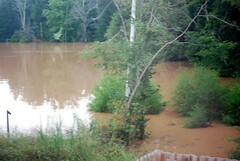 We have a creek and a forested area behind us and we are always worried when it rains really hard. Luckily we’ve never seen anything like you had. We would be freaking out also!! Oh my goodness, Shanny! That is just horrible. I’m so glad that the water stopped before it reached your house. 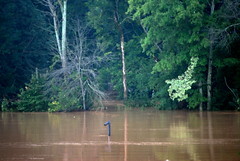 Some friends of ours were flooded out when Annapolis flooded during Hurricane Isabel back in 2004. Hope it recedes quickly. EEEK!!!! So glad the water didn’t reach your house. i know it’s mean to laugh, but i can just SEE csp running around doing that and i don’t even know him!!! glad you didn’t have to climb out on the roof with the puggies and your valuables! it’s sept. 6th today and after our near miss with hanna in the last 2 hours, i’m SO over tropical weather (i slept all of 2 hours last nite). i don’t think i can handle the rest of hurricane season without some serious medication.